1. A blog article that contains links to other articles covering a specific topic. Step right up, Ladies and Gentlemen! My online friend and fellow blogger, Tamara Suttle of All Things Private Practice, is hosting her first ever Blog Carnival today, and my post below is one of five articles include in this “exciting and riotous mixture of writing” on her theme, Creative Responses in Building A Private Practice. So take in my post on combating your inner critic that follows (rated G for general audiences, not just private practitioners), and then check out the main carnival tent on Tamara’s blog, Private Practice From the Inside Out, as well as the contributions of the other carnival participants (noted below). In the early stages of building our practices, when we have literally HOURS to let our mind wander while we wait for clients to call or show, it is easy to get in the habit of obsessing over all the ways in which we might have screwed up so far. Because I know from my own experience that when I get in the habit of humoring my inner critic, I get out of the habit of trusting my ideas and decisions, and become less daring, less creative, and less bold than I might otherwise be. Moreover, I am sure that in these moments I also secrete a palpable low-self-confidence energy that does nothing to encourage my clients to trust my input. All of this is, obviously, bad for business. But it is also, most definitely, bad self-care. And as we are in the business of caring for other people, it is of supreme importance that we make a habit of first caring for ourselves. So, join me now in stepping away from immobilizing self-criticism, and instead belly up to this bar of creative confidence-giving comebacks. This is a war. Know your enemy. Describe your inner critic in detail. Give her or him a life and a name. Get to know Ms. Negative Nellie or Ned intimately. My own monster looks and acts a lot like my scary elementary school coach. He is both vertically and horizontally huge, with dark eyes, a perpetual frown, and an absolutely booming voice that yells at me to “SIT ON THE WALL, BARKER!” every time I don’t measure up. I call him Coach Meanie. Talk back to the monster. Firmly and with wild abandon. Refute. Debate. Cheerlead your head off. Maintain a journal of all the things you’ve done right. Write down your victories, both large and small. Don’t be shy. Blow your own horn loudly. This discipline encourages you to focus on the positive instead of the negative, and gives you great talking points with which to debate the monster. If there are times you can’t quite muster the ability to advocate for yourself, assign the comeback task to a trusted cheerleader type. Think of the person in your life who, when you were growing up, always had something good to say about you (your grandmother, a coach, a parent, a best friend), imagine what that person would say to your inner critic in this moment, and then say it. Go on, BE THE GRANDMOTHER! Create a cheerleader out of whole cloth. This alternate version of Strategy #4 comes in handy during those moments when your cheerleader just isn’t up to the task, or if you can’t think of a real-life person with a resume that qualifies them for the cheerleader position in the first place. Imagine your inner critic as a nasty little devil sitting on your left shoulder, and then counter this image with one of an angel on the right one. This angel could be the aforementioned cheerleader-type person, but with super powers. It could be a Disney character (Robin Williams’ Alladin Genie comes to mind), or something/someone completely of your own invention. Whenever your self-doubt monster gets out of hand, sic your little angel on him, stand back, and watch the fireworks. My angel is a tiny Glinda the Good Witch from the Wizard of Oz. She is beautiful, effervescent, poised and polite, but with a runway-model-fierce attitude and a wand that can freeze Coach Meanie from 20 feet. Ask people how you’re doing. Go ahead; ask the difficult questions. Ask if what you said came out wrong, if this piece of marketing material is too slick, if there is any additional training you could benefit from. The truth might hurt a bit, but it’s probably not anywhere near as scary as the script your inner critic is pushing. It’s even okay, good therapy even, to ask a client how they are feeling about your work with them. Because I have such a running self-doubt monologue, I have made a routine out of this last one. Somewhere between session 4 and 6, I check in with the client to see how we’re doing so far, how my approach and our efforts are working for them, and ask if we need to tweak anything for the experience to be more helpful. Nine times out of ten, they report that we are on track, and Glinda can tell Coach Meanie to take a hike. That tenth time, if they do have a critique or request, it doesn’t have to feed the self-doubt monster because I’m open to receiving it and ready to use it to enhance our work. Speaking of Our Clients . . .
You get extra points for paying attention if you’ve noticed that all of these comebacks can also be shared with our clients as we help them learn to combat their own inner critics. I’ve suggested these strategies in session at one time or another, and have always received positive and, yes, sometimes hilarious, feedback. So go ye out and slay the monster, and teach others to do the same. And tell us the tale as you do. Do you have your own creative strategy for dealing with your inner critic? Did this post inspire you to think of a particularly witty comeback or an especially juicy self-doubt monster description? Get your creative juices flowing and share your results in a comment below. And be sure to check out the other writers participating in this carnival, and comment generously on their sites. We’re all one big, happy blogging circus family today! Kat Mindenhall, LCSW, at A Peaceful Life’s Blog, is writing today on Why You Should Reinvent the Wheel. Nina Danhorn, MS, NCC, at Laska Counseling offers her thoughts on Self Care for Healing Professionals. Kate Daigle, MA, LPC, NCC, at Kate Daigle Counseling is thinking about Nourishing Growth and Giving Breath to My Hungry Private Practice. And, finally, Giora Carmi, ATR-BC, LCAT, BCPC, BCIM, at Intuitive Flow, brings an art therapist’s perspective to building a private practice with his post, Pricing Policy. This entry was posted in Self Esteem and tagged inner critic, self esteem. Bookmark the permalink. All I can say right now is…THANKS!!! I am in a rush for the office but forwarded this to my business email so that in my open slots today I can read these posts thoroughly and have my own private carnival. Thanks again Tamara! Woohoo! Let us know how you like the carnival, Linda. I really appreciate the creativity of your post! I have been battling my inner critic for years, and have now actively tried an approach of “befriending” her instead of trying to avoid her or push her away. I ask her what she needs, what she is afraid of, and sometimes I can get a deeper understanding of Kritic Kate’s intentions. I like #6 of your list – facing our fears. This is something I’m trying to implicate into my daily life (professional or otherwise) and is a challenge at times. I think it helps us grow as professionals to be humble and check in with our clients about how things are going — they are, after all, in our care. I’m inspired to name more of the parts of myself — my cheerleader, my mentor, my perfectionist. Thanks for getting my brain moving today! Kate, I LOVE your creative idea of “befriending” our inner critic – a way to work with a side our ourselves that does, in fact, have its own history, needs and worries. A kinder, softer approach, if you will, and one I plan on trying out soon. Thanks for checking in and offering your wisdom here. My pleasure entirely, Bob. As you can probably tell, I enjoy adding a bit of fun and humor into my work! Thank YOU for checking in here all the way from California. Hope to hear more from you soon – perhaps how you’ve come to name and describe your inner critic? This is such a great and thorough way to look at your inner critic! I especially like the aspect of looking for feedback from others because this is exactly what we don’t want to do sometimes if we are fearful of getting information that supports our critic’s voice. But, like you said, 9 out of 10 times something is validating and helpful. Thank you! Yes, Kat, you are absolutely right. We often shy away from accessing information that might give our inner critic some new material for its script. But we have to risk that possibility, don’t we? Not only so that we can uncover and celebrate the good stuff, but also so that we don’t miss an opportunity to assess and stretch our growing edges. Thanks for your comment! Annie. Just what I needed to read and ponder today. As I am considering a new venture and my self doubt (The Blob) creeps up, your words are perfect timing. Thank you. The Blob. I love it! And I can picture it, too. Of course you are quite welcome, but I’m also counting on you to remind me of my words when I forget to follow my own advice. We’re all in this together! 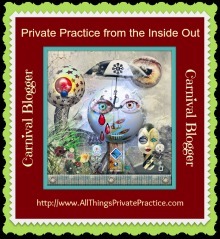 Anne, I’m so tickled that you chose to participate in our very first Blog Carnival! Thank you! PS – CrankyAss. Yep, that is the name of my little critic! :) Have a great day! Hah! Maybe we should hold a play date for all of our inner critics. Let CrankyAss, The Blob, Coach Meanie and the rest get out and mix a bit. Or maybe we don’t want them to get any ideas from each other! Tamara, I can’t thank you enough for having the energy and organizational skills to pull off such a fun idea. When’s the next one?! Can I come and play with your monster? When my monsters come I ask them if they want to play with me. I give them the stage and turn on the light. I tell them: OK now, show me what you can do. And they show me all their muscles. They are frightening. I ask, can you show me more and they do. I tell them how much I admire their strength. I look in their eyes and see that there is not only menace there but they are also checking to see if I am impressed, and then I notice that even though they really try to hide this, they are actually afraid. Yes, afraid. So I listen to their fear and as I do, they start to dissolve, just as a frightened child dissolves in the embrace of a loving mother. You have to try this and see that they do. When they are almost gone, I say quickly, before they disappear: Come again when you are afraid, OK? I love your post, Anne. I loved playing with your monsters. Thanks so much for the shout out, Giora, and for stopping in to play!